Part of the enjoyment for me of being in my garden, is the fact that I can get closer to nature. I love hearing the birds sing, and seeing the friendly Robin when i’m digging in the dirt. Birdhouses can help encourage birds into your garden, provide an important function and also look incredibly pretty. 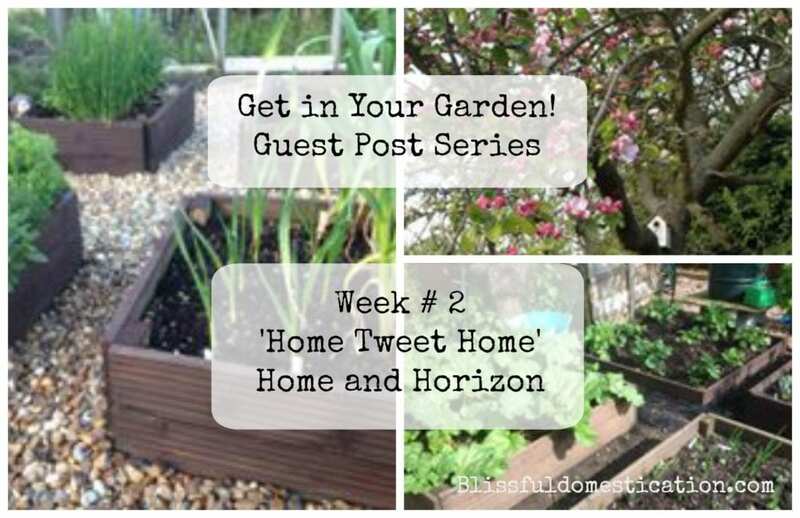 Week 2 of my guest post series is bought to you by Lauretta from Home and Horizon, who shares my love of birdhouses. 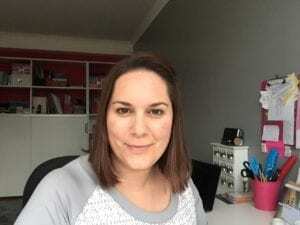 This will inspire you to add to your own birdhouse collection, so let me pass you over to Lauretta…..
Hi, I’m Lauretta – a young at heart travel editor who blogs on affordable travel and thrifty interiors at Home and Horizon (www.homeandhorizon.com). I live in Kent with my husband and kids (Luis 11 and Nadja 9) and I enjoy weekly family ‘treat nights’, boot fairs & pic n mix sweets! I’ve always admired birdhouses, long before I’d even thought about owning my own place with a garden. I used to decorate them as a kid and would sit there wondering how birds fit through the tiny hole at the front because it seemed so small. Nowadays there are some fabulously designed birdhouses and I’d class these among my favourites. In fact, the more elaborate the better! 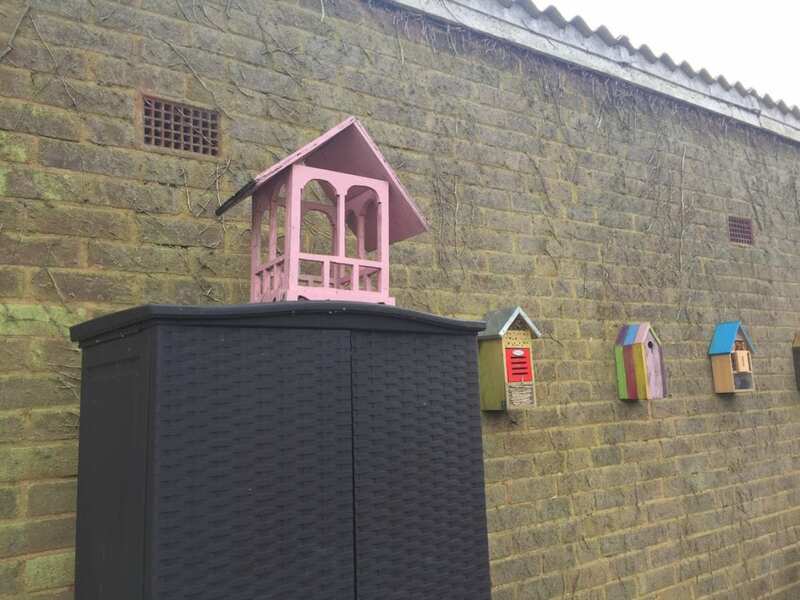 You’ve got birdhouses that look like caravans, sweet shops, pubs and little houses – they’re all just so cute. However, have you ever stopped to wonder where birdhouses originated? It’s actually really interesting though to read the history of the birdhouse – and how its design has changed across different parts of the world. Just to give you some idea, according to sources on the internet (if they are to be believed), the first birdhouses were thought to be built as early as the 13th century (documented in the 15th century). They were made by the Turks…mmmh, maybe that’s why I’m so drawn to them (I’m half Turkish!). The first ones that were made were made from wood but, as we all know, wood rots and so they didn’t last long. Later on they were built using harder materials. Birdhouses were initially designed to offer birds a safe place to live. This is a bit strange if you think about it as, for thousands of years, birds have survived without the intervention of humans. In fact, they don’t really need a birdhouse at all – they just need a nest, which of course they build themselves, usually amongst the branches of trees, to state the obvious. In terms of their development, the first birdhouses were very basic in their design and structure but over the years people started to decorate them and even make them for specific types of birds. In the 19th century birdhouses had a curved top to collect rainwater so the birds could drink water, and they’ve since developed right up to the present day with birdhouses that can be attached to your window to get a bird’s eye view – pun intended! Even birdhouses with cameras can now be purchased to watch chicks hatching – even from a smartphone – now that I love. But what I love doesn’t necessarily mean I have, so the camera box will have to wait until my birthday I think. But what I do have is a little collection of birdhouses in my garden; well, some would argue I own above the average number of birdhouses per garden, but I simply can’t get enough of them. 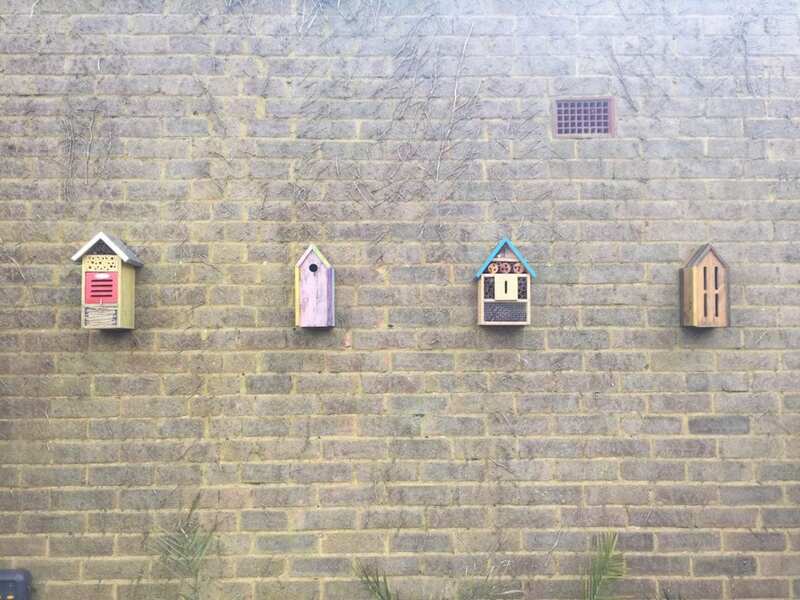 For me, birdhouses remind me of long, lazy days pottering about in the garden, soaking up the rays on sunny days and having fun with the family. I always thought they helped brighten up the garden, offering a splash of colour to an otherwise dreary corner. Most of all, I love it when the birdhouses actually get used, and I’m lucky enough that some of mine have been. As a side note, the birds also like being fed (who doesn’t?) and I use this pink bird cage table to put birdseed out. I actually picked this up from a boot fair for 50p, then spray painted it pink. It has lasted me about six years so far – and I’ve only repainted it once. As you’ll see, I’ve had to put it on top of a cabinet as the birds were not using it when it was lower to the ground and to keep the birds out of harm’s way. These two birdhouses are particularly important to me. 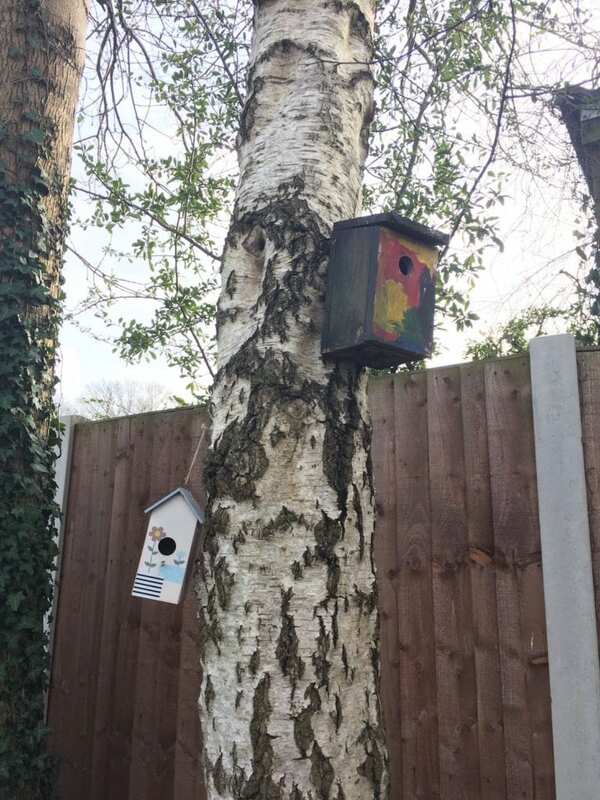 The one on the left was bought by my son (with his own money bless him) from Poundland and the birdhouse on the right was painted by my daughter at a garden centre event a few years ago. In this next picture, you’ll see more of the smaller birdhouses (bought from Poundland), along with a birdhouse (top) painted by my son. 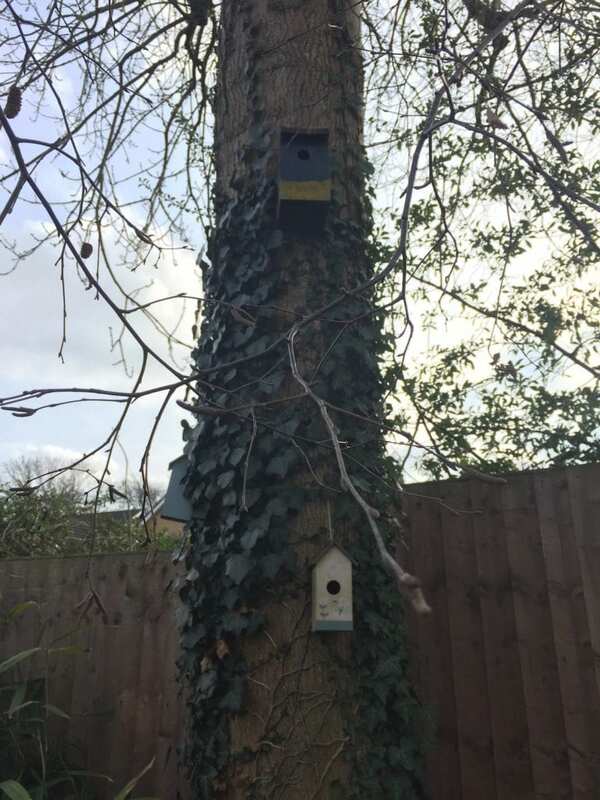 Along with the varied birdhouses that I seen to pick up from a variety of places – TK Maxx, boot fairs, garden centres and even eBay to name a few, I’ve also picked up bee houses, ladybird houses and insect houses – just to mix things up a bit. All of the below (fixed to our garden wall) came from either Homesense or TKMaxx, most of them purchased in the sale – and all less than £7. They are great quality and have lasted a long time. 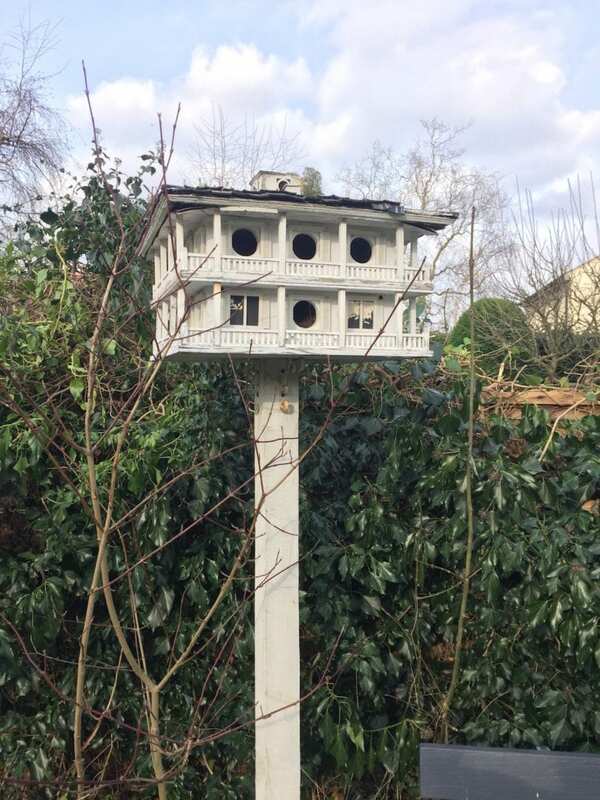 But possibly my favourite birdhouse (or ‘bird hotel’ as I like to call it) is this huge birdhouse featuring individual ‘rooms’ for birds – hence the nickname ‘hotel’! When I went out to take a picture of it for this post, I was delighted to see that a bird had made it its home and built a nest inside. I didn’t go too near in case it was watching – and I scared it off, but it’s so lovely to see that it has provided some shelter. This birdhouse was a bit pricier – at £50 – and came from Homesense. 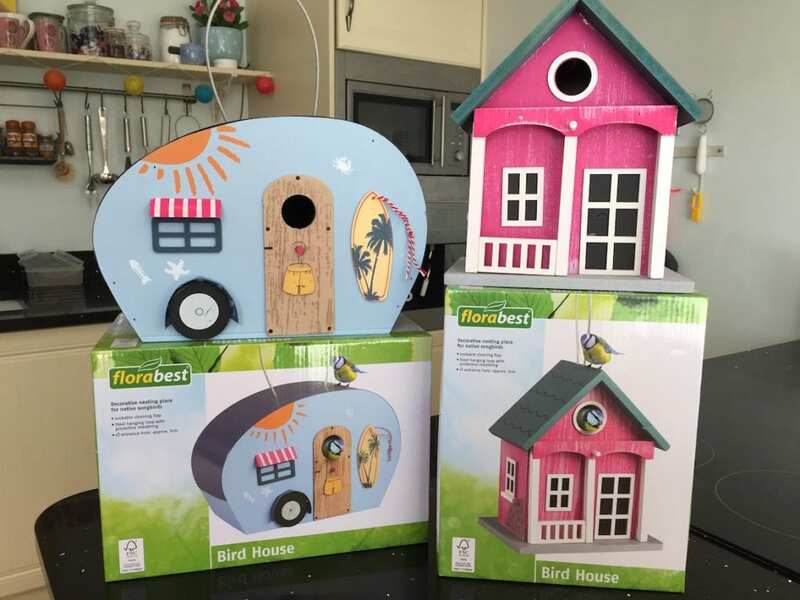 Last but by no means least are these super cute birdhouses from Lidl. They cost me less than £7 each and I simply had to have them when I saw them; how could I not? The gimmicky birdhouses remain my favourite – I love some of the detailing and miniature features they have. I think they remind me of dolls houses that I used to play with as a little girl. As you can see, I haven’t yet added them to my garden, but there’s a good reason for that; the secret to the longevity of a birdhouse is in the preparation. You see, I don’t just buy a birdhouse and stick it in a tree. If I do (and I have done), you’ll soon find out that the constant battling with the elements means that it won’t last very long. However, if you take care to do a spot of varnishing (and revarnishing), then your efforts will pay off. Trust me on this one. So what about the future of birdhouses? Who knows what new birdhouses will develop in the future? I’ve clocked ones that look like London telephone boxes and ones that are based on films (a Star Wars’ Death Star! ), to birdhouses that resemble Japanese gardens and even little towns – I suppose the design is only limited by the imagination of its creator! Meanwhile, I’m going to keep adding to my wonderful collection of birdhouses, keeping an eye out for the particularly unique ones. I’m fortunate to have a fairly large garden so I think I can get away with adding a few more. Thank you so much Lauretta. Some lovely birdhouses, certainly makes me want to add to my collection! 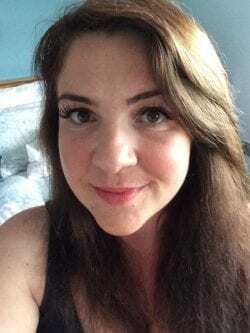 Lauretta blogs on affordable travel and thrifty interiors at Home and Horizon, and you can also find her on Twitter, Instagram and Facebook. If you are enjoying this series, don’t forget to fill in your e-mail address and I’ll let you when a new post is published. If you would like to feature in this series, then please get in it touch! Love the birdhouses! The dolls house is so cute and the camper van with surf board is amazing! so unusual!